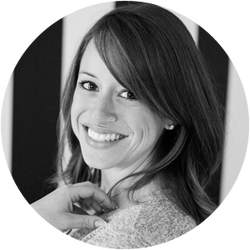 Jaime Gill, Owner & Designer of Eikoh Design Studio created It's Handmade in the Fall of 2015 as a way to feature small, local, handmade Maryland businesses. 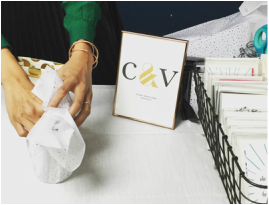 This 1-day pop-up shop will include a variety of goods and unique items that will make the perfect gifts for everyone on your list! Summer holidays, parties & wedding season is coming, and the It's Handmade—Summer Edition is here. Hope you will join me! Beautiful & modern custom hand-sandblasted glassware and LifeSquare—a unique product we developed as a special way to display life's photographs. 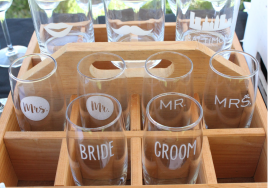 All of our gifts can be completely personalized to tell a unique story, and make great gifts for any occasion! Screenprinted dog bandanas. 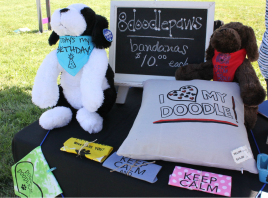 You choose the color of the bandana and we make it specifically for your pup! Also shop beaded bracelets for children and adults, and just added: Burlap & Canvas prints! Maryland-themed home and paper goods including prints, greeting cards, coasters and more! Fun and functional ceramics, including berry baskets, bowls, trays. 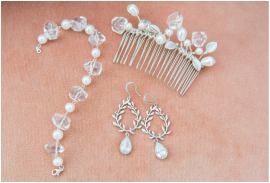 J'Adorn Designs makes couture & custom handcrafted jewelry in Baltimore. Designer Alison Jefferies specializes in adornments for brides, gifts for wedding attendants and loved ones, but also accessories to highlight the unique spark in every woman. Whatever the occasion, she makes the perfect piece! Photographs of my travels to different places throughout the country. Places around Maryland, New York, Colorado plus my time spent in Italy, including their architecture, animals, and landscapes. Custom ordering is available on any photograph. ​Black and white is also available. 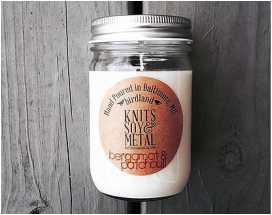 Our all natural, hand poured Soy candles are made with classic scents that are Individually made and poured at the time of purchase, to ensure the freshest and most fragrant soy candle available. An assortment of greeting cards for all occasions. Illiah will also be providing a gift wrap table! Stop by to have your gifts beautifully wrapped after you've shopped. Packing options include, silver diagonal stripes on kraft paper, raffia in addition to a small assortment of gift bags. The Painted Palette is Baltimore's best venue for art and wine entertainment! In a relaxed, social, group setting, an artist will guide you through replicating the night's featured painting. Whether you are an aspiring Van Gogh or just looking to explore your creative side, you'll be amazed at the artwork you have created! Painted Palette will be on-site hosting a paint session just for our event! Paint your own 10x10 canvas for $20, and take it home to gift or hang in your home. They are also graciously donating 20% back to Matt's Mission and ALS Research! Wight Tea Company uses high-quality teas and herbs to create unique loose-leaf tea blends. Stop by to check out & sample their tea! Then, grab some of their loose-leaf teas for your home or gifting needs.